Unique bird food requires a unique bird feeder. 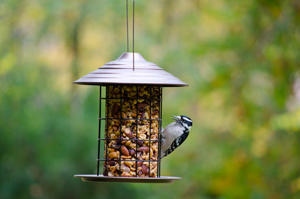 Our Seed Cylinder Feeders are the perfect blend of creative design and bird feeding functionality. Whether you want to attract clinging birds such as woodpeckers or perching birds like chickadees, these feeders will accommodate a variety of birds and their eating preferences. One of the nicest features of a seed cylinder feeder is the extended views you get of the birds as they work the seed off the cylinder. Seed cylinder feeder have less debris and loose seeds cast off as well so they are a good feeder for areas where you want to see the birds but do not want a lot of mess.